I found the most beautiful boxed soap not long ago at Marshall's. 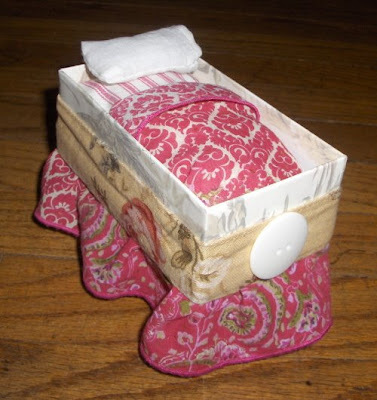 The soap smelled divine and I just knew the box would be the perfect size for a doll house bed. 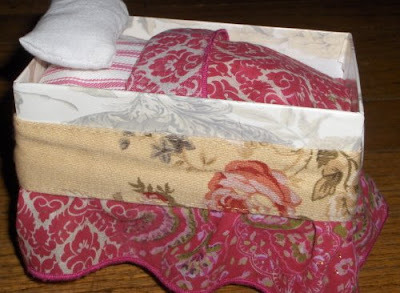 First I cut a strip of fabric to go about one and a half times around the bed (box). I then basted it with a large stitch so that I could gather it a bit. I then carefully glued it around the lower outside of the box to make a dust ruffle. The pink paisley print at the bottom is what was used for this step. After that I took a pretty tieback that was cut from a thrifted curtain, pressed it with the iron and cut it to fit perfectly around the box for a trim to cover the glued portion of the dust ruffle. This trim was hot glued into place as well. Two nice large buttons were glued -- one on each end of the box -- for decoration. I then cut a mattress out of some red ticking I had in the scrap box. The mattress is deep and shaped like a real mattress. The top and bottom pieces of fabric were cut to fit perfectly into the box with just enough room for a seam. Then a strip as deep as the box was cut to go all the way around the box to make the "side" of the mattress. It was sewed together first by making a seam in the side strip, then sewing (right sides together) the top to the strip, then (again right sides together) the bottom piece to the side strip, leaving a small opening to turn the mattress and stuff the mattress and then sew it up by hand. 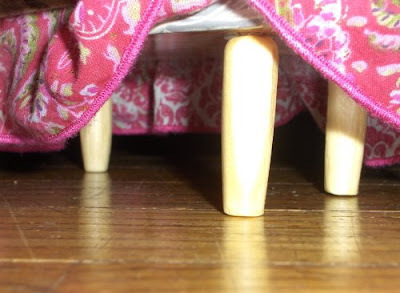 The legs on the bed are long wooden beads, hot glued into place. 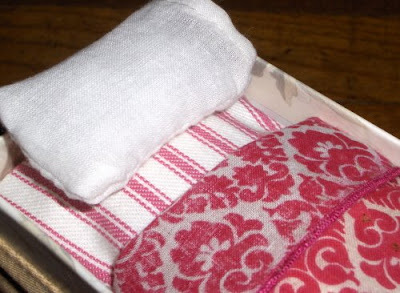 The last step was to make a sheet and a little downy pillow. Princess of the Universe LOVED it and was inspired to make her own bed. We'll be posting about that later. PS - As always, a reminder to supervise all use of glue guns and craft materials and scissors and sewing machines when working with children. Lynn, I am just so impressed. I actually showed my husband. His wheels get a turnin'. Thanks for taking the time to write it up. I've been keeping up on my blog about our very simple Advent celebration and IT TAKES A LOT OF TIME to post with links, pictures, commentary! I appreciate the labor of love and the sharing you do. you are a wonderful inspiration. I'll definitely be checking your blog today! It is so lovely...any Dolly would feel like a Princess sleeping in that bed!